Each week at Good Shepherd Lutheran Church of Fox Chapel, we gather together to encounter God’s word and respond in song and prayer. We share the bread and wine of Holy Communion at the Lord’s table. And, at the end of the service, we go out into the world to share God’s message of love and forgiveness. We invite you to join us in worship! 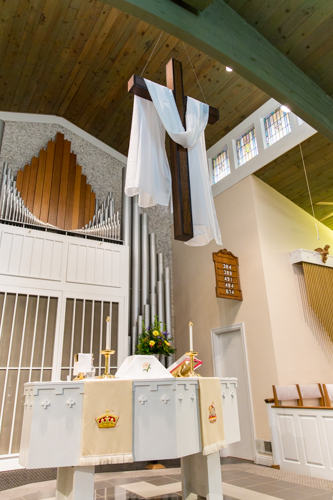 Learn more about ELCA Lutheran worship. Sunday Worship: 8:00 a.m. & 10:30 a.m.
Sunday School: 9:15 a.m. – 10:15 a.m. Adult Bible Study: 9:15 a.m. – 10:15 a.m.
Maundy Thursday Traditional Seder Meal 6:30 p.m.
Good Friday Solemn Service 7:30 p.m.
Christmas Eve Candlelight Communion Services at 4:00 p.m. & 7:00 p.m.
Want to join us for worship? We would love to have you!